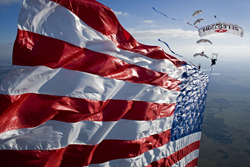 The 9th annual Pat Rupp Memorial Golf Tournament will include airshow performers, Team Fastrax, who will be performing their famous American flag skydive. The tournament benefits the children’s programs at Catholic Social Services of Miami Valley. We are thrilled to be performing at such an important event. There are so many children out there in need of help. On Monday, July 28, 2014, the 9th Annual Pat Rupp Memorial Golf Tournament will be held at the NCR Country Club in Dayton, OH. There will be a 1 o’clock Texas Scramble Shotgun start and GROSS and NET Divisions for scoring. Just prior to the start, at 12:45pm, Team Fastrax™, a world renowned skydiving team, will be performing their American Flag Skydive. The performance will include their amazing 1,100 sq. ft. American Flag as well as a red, white, and blue streamer. It’s sure to be a sight you’ll not soon forget. The event is being held to raise money to support the children’s programs of Catholic Social Services of Miami Valley (CSSMV). For more information on sponsorship or registration for the event visit the CSSMV website.